in the new conference room 408 Bridge Street. In August, the Bridgeton Improvement Committee joined the New Bern Area Chamber of Commerce in the non-profit category. The New Bern Area Chamber is the Chamber of Commerce for all of Craven County. A representative of BIC will attend the monthly Non-Profit Council meetings, mingling with other non-profits in the area, learning strategies to successfully run a volunteer organization, and accessing grant writers. BIC is anticipating implementing great ideas to continue to bring excitement, revenue, and improvements to our area. BIC is continuing to upgrade the Community Room by the Police Department. Logos for BIC, Bridgeton Community Watch, and Bridgeton Police Department have been prepared by Jamie Kirkman. These will adorn the doors to the two offices and the two flower planters out front. BIC has taken on the Welcome Basket project that Community Watch initiated. Our first two baskets have been delivered, a third is ready, and we are actively collecting items to fill more. BIC is partnering with BCW for a First Responder Appreciation dinner. The dinner will be at the new Tri-Community Fire Department on Monday, September 10. Boots Parker has prepared the menu and servers for the event. The dinner will include spaghetti, meatballs, salad, dessert, and drinks. George & Sherri Burens are already anticipating Santa's arrival in Bridgeton. The date has been set for Sunday, December 2. Confirmation of the time and place is forth coming. 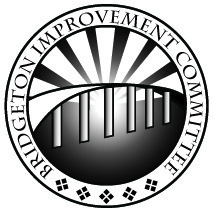 Bridgeton Improvement Committee, (BIC), was formed in May, 2007 as a 501(c)3 non-profit organization. Our stated mission is to improve and enhance the visual and environmental aspects of the town of Bridgeton, NC and thus improve the quality of life for its citizens. Our latest project is this new sign which welcomes drivers to Bridgeton as they enter town from New Bern or Hwy 55. The sign was installed June 3,2015 and will hopefully last many years. This sign was paid for by BIC and meant to match the sign bought by the Sunrise Rotary which graces the other entrance to town on Hwy 17. Every Christmas BIC facilitates the arrival of Santa Claus by helicopter and firetruck. Music, snacks, Christmas sing-alongs all combine to kick off the season in a festive spirit. If you would like to participate in or assist in supporting this happy event Contact us. Announcing the launch of www.BridgetonBiz.com a continuing online work that we hope will eventually list all businesses in the Bridgeton area. In our town there are a number of interesting enterprises that people outside the town limits may be unaware of and one of them may be just what you are looking for. BIC bought and planted a 25' Christmas tree and supplied decorations and labor to place them. Lighting the tree is an event of prime importance to the celebration when Santa arrives each December. BIC, with the help of Lowe's Home Improvement, Coastal Dragline Service, Martin-Marietta Clark's Quarry and Damco Steel, has created a small park at the end of W. Bridge Street. This was to repair Hurricane Irene damage to the bulwark and to provide a restful spot for Bridgeton residents and visitors to view the beautiful sunsets across our Neuse. The official dedication was Saturday, June 22, 2013 with a congenial crowd and Mayor Rodman Williams cutting the ribbon to open the park to the public. Each year small donations are made to local organizations we help support. Decisions are made with special emphases on the youth of our area.